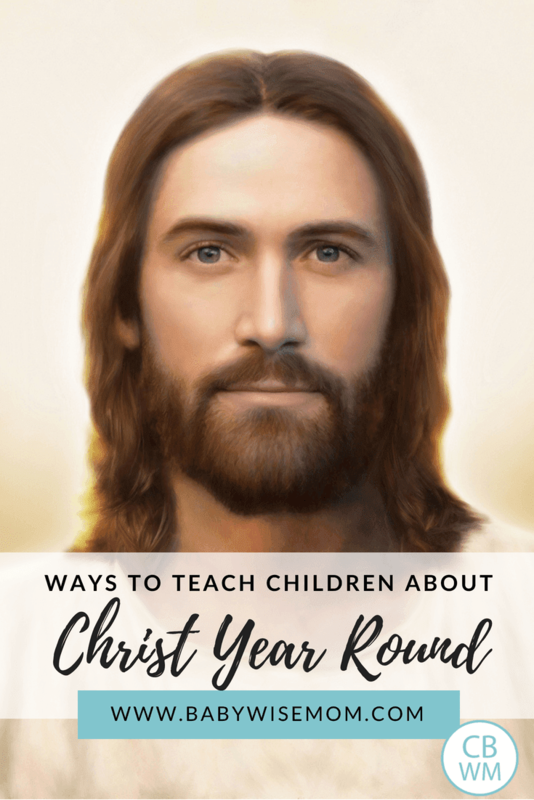 How To Teach Children About Christ All Year. Focusing on Christ is not just a Christmas thing. 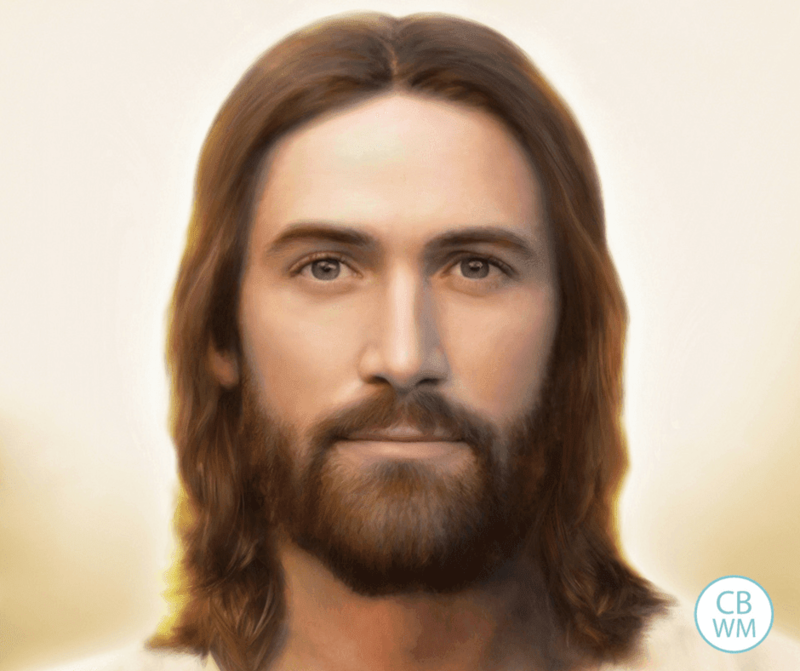 In this post are tips for teaching about Jesus Christ year round. What we do to teach our children about Jesus Christ on a regular basis is really quite simple, but often the simple things in life prove to be the hardest. We do things that are bit by bit each day and each week. I will break it down into simple categories. I would encourage you to work on one category at a time. That seems to be less overwhelming. Once you have one category down, move on to the next. Do not underestimate the power of these simple things, and do not wait for your “baby” to get older before you start them. I erroneously assumed Brayden wouldn’t gain anything anyway and waited until he was older before doing many things. That was very wrong. I have watched my girls absorb and emulate things as they have grown up with these things present in their lives from birth. Even an infant can benefit from the spirit that comes from doing these things. All of these categories are important, but I would definitely consider this to be one of the most important categories. Pray, pray, pray with your children. Pray for your children. Each day, we pray over every meal as a family (the family who is there). We say a morning family prayer and an evening family prayer. We each say individual prayers in the morning and in the night. Even for our babies, we say their individual prayers for them until they are old enough to start to pray on their own. They learn the proper way to say prayers simply through about two years of example before they start to pray on their own. We study scriptures each day. With Brayden, I read to him each morning from a magazine published by our church. Kaitlyn is almost old enough for this, but most stories are too long for the three year old attention span. Each evening, we read the children a scripture story from our illustrated scriptures. We then read from actual scriptures. They don’t get them very well yet (and Brayden once commented “all of these scriptures sound the same.”), but I can see Brayden starting to understand the language of what is being said. I want my children to understand scriptural language. I also want to have a habit well-established and the precedent set that this family reads scriptures together. It is also good to tell scripture stories. The scriptures are full of interesting stories–tell your children the stories in your own words. Tell the stories of Jesus. We also have a scripture we work on memorizing at all times. Hopefully this helps the children come to remember key scriptures throughout their lives. Music is a powerful way to teach. We will sit at our piano and play children’s hymns. Doing this has brought more gospel discussion into our home than any other activity. More questions get asked while we sing these songs than anything else we do. We also play children’s hymns on an iPod during independent play. Each week, we have an evening set aside we call “Family Home Evening.” We take turns teaching the lesson. We discuss a gospel topic. We start with a hymn, followed by prayer. We then discuss family business. Then we have our lesson. We end with a prayer. We then spend time doing something as a family and sometimes have treats. The topic is chosen by the lesson-giver. And, yes, I definitely use this time to teach about things I see problems with during the week. For example, the first time Brayden lied to me, our next lesson was on honesty. Might I also comment that for whatever reason, this weekly event does a whole lot of good for the behavior and obedience of children. I can see a stark contrast between weeks when we do this and weeks we don’t. For inspiration on what to do at these lessons, you can check out the Family Home Evening for Children blog I organized. There are several amazing women who help contribute to the posts on this blog. This is something you need to watch for. These are moments that come up unexpectedly. It might be in a child’s action or in a conversation. It might come from your child observing you in your daily life. These moments come up and are the strongest teaching moments because they are natural. The child is asking questions and ready for answers. If you don’t know the answer, don’t worry! And don’t make an answer up. Take your child to the scriptures to find the answer. Just imagine how much he will learn as he watches how to find the answers to his questions. We have a picture of Christ in every room in our home except for the bathrooms (I have nothing against a picture of Him in our bathrooms, I just haven’t decorated those at all yet). We even have pictures in halls. A great way to teach about Christ is to do your best to treat others the way He did and the way He would. When you see others in need, you do what you can to help. You take time, effort, money, and talents to bless those around you. Involve your children. Point out the nice acts of service they do around the home. You can do activities to help the children be excited about service. See the service posts on the Learning Blog for some ideas to get you going. This category is so important. You must be an example for good in all of these areas. You must say your own prayers. You must do personal scripture study. These things will help prep you to be ready for those teaching moments as they arise. Serve others and love them. If you don’t love certain people, pray until you do (not continuously 🙂 ). Don’t make Jesus Christ a stranger who you talk about at Christmas time. You can teach about him on a daily basis. It takes time to build all of these habits, but the effort is well worth it. What do you do to teach about Christ all year round? Loved this post, thanks so much for it. Reminded me that I need to be more intentional, even if she is only 7.5 months! Thanks so much for this post! I didn't grow up in a practicing Christian home so I often feel kind of lost as to how to teach my own kids about our faith. I love the idea of the family home evening, sounds like a really good way to ensure everyone slows down during the week and comes together to keep priorities in order.One thing my husband and I have done is during our dating days we started praying before meals together, regardless of where we were. It was such a blessing because by the time our son came along praying before meals was ingrained in us as a habit. Then I added scripture reading before bed, and our next goal is to add in bedtime prayers for us and Tobias. I find that adding one thing at a time for 3 months is easiest because then it's habitual by the time you add something new. This is a great summary of so many wonderful things. We do a lot of them, but sometimes I forget the "why" behind all of it. Thanks for the reminder to help my children have a personal relationship with Christ. You are welcome everyone!I agree Manda, it is easier to take on one thing at a time.